Do your staff know what to do in the event of fire? Is there an appointed person to take charge and organise people in the event of an emergency? Can your staff confidently choose and use a fire extinguisher correctly? 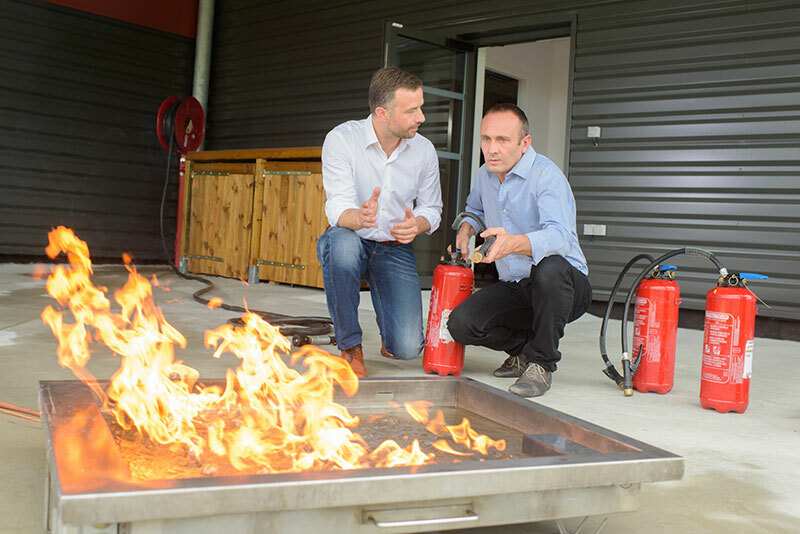 If the answer is 'no' to any of the above, to safeguard your business, employees and visitors, it is imperative you seek appropriate fire safety training. We use the latest equipment to simulate practical hands on training, whilst of course ensuring the safety of delegates and consideration to the environment. to prevent outbreak of fire and to minimise damage if one should occur. to safeguard employees, the workplace and the business from the danger and destruction of fire. As such Vulcan Fire Ltd has developed a range of fire safety training courses tailored to meet a variety of customer needs and suitable for all levels of delegate experience. Our training courses are reviewed regularly to include the latest legislative changes and are delivered to a guaranteed standard by our qualified and experienced professional instructors. Fire Training Simulators allow delegates to practice fire extinguishing techniques and crucially build confidence in using them. (A space of 25m flat hard standing required for use of the Fire Training Simulator). We tailor our courses to suit the specific needs of each customer, in particular reflecting the nature of the premises and environment in which they work. This ensures training is more interesting, engaging and effective. Our delegates receive course notes and handouts and are awarded certificates on successful completion of the course. We will also provide reports on each delegate's achievements if required. Courses provided by Vulcan Fire are fully tailored and delivered in-house, scheduled to a time and date of your convenience. Protect your staff, your premises and your vital systems by keeping your staff fully trained in fire awareness giving them the expert knowledge, experience and confidence they require. For more information on fire safety training for your business or to book a course, please Call Vulcan Fire on 0845 017 8184. Vulcan Fire are based in Rochdale, Manchester however, we deliver our services and training courses UK Nationwide. Our mailshots are occasional and we will only send news articles & details of products & services we believe to be of interest to you. You may unsubscribe at any time. Vulcan Fire are BAFE approved, independent fire safety consultants offering a complete design, supply, installation & maintenance service. From Risk Assessment to Training, we provide the protection your home or business needs including your staff and visitors whilst keeping compliant with the law. Based in Rochdale, Manchester our services extend UK Nationwide with 24/7 support. Fire Safety, Electrical Solutions & Security Call 0845 017 8184 today!